Why Isn’t Anyone Marking Andrea Pirlo? Andrea Pirlo won the World Cup in 2006, the Champions League in 2003 and 2007, as well as the Scudetto in 2004 and 2011. He was once called “the Magic Johnson of football.” Along with Barcelona’s Xavi, Pirlo has been perhaps the most obvious example of the resurgence of the deep-lying playmaker. 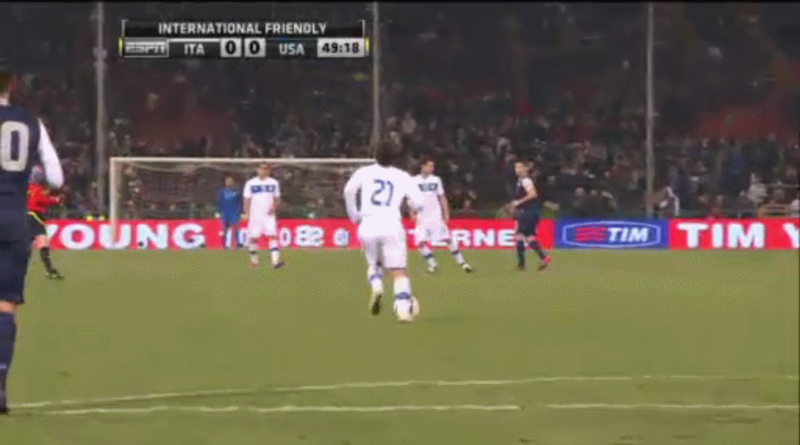 Why then did no one bother to mark Pirlo in USA’s historic 1-0 victory over Italy? The above image capture was taken from the 50th minute of that match. At that point, the current Juventus star had already attempted 69 passes. Yet the sight of an uncontested Pirlo pushing the ball upfield was an all-too-common occurrence. So why wasn’t more attention given to Pirlo? Perhaps the Americans, given they were playing in a friendly, weren’t sure of the style of play the Italians would use. Let’s hear what Carlos Bocanegra had to say about what the gringos expected from Italian manager Cesare Prandelli. So even though they knew a deep-lying playmaker would be sending passes over the top, it wasn’t considered a good idea to actually, you know, defend that guy? This is what an attempted passes chalkboard looks like when no one tries to press an outstanding passer. And it’s not like there isn’t precedent for how to neutralize Pirlo. Sir Alex Ferguson, Manchester United’s legendary manager, provided the perfect example for how to mark Pirlo. Two years ago United knocked Pirlo’s AC Milan out of the Champions League because of Ferguson’s brilliant strategy for defending Pirlo. United fielded a 4-4-1-1 against Milan’s traditional 4-3-3. Midfielder Park Ji-Sung, lined up behind Wayne Rooney, was used first and foremost as a defender. At times it seemed like he was following Pirlo around the pitch. The ingenious part of the strategy was that when United grabbed possession, Pirlo was forced to mark Park. But the languid Italian couldn’t keep up with the indefatigable Korean. Thus, Park – despite tightly marking Pirlo – was still able to link the defense to the attack when United had the ball. What was so odd about the American’s failure to mark Pirlo was that they were essentially using the same formation as United. Clint Dempsey easily could have stepped into the Park role and made Pirlo’s night much more difficult. But instead of staying goalside of Pirlo, Dempsey positioned himself behind the Italian. This meant Pirlo simply had to step forward to avoid Dempsey. With Michael Bradley and Maurice Edu already occupied by the two other center mids in Italy’s 4-3-1-2, Pirlo could saunter up the pitch and pick out passes without facing pressure. Without being a fly on the dressing room wall, it’s impossible to know whether or not Dempsey’s failure to closely track Pirlo was a result of his diffidence toward defending or a lack of instruction from Jurgen Klinsmann. Regardless, the failure to press Pirlo was a blemish on an otherwise almost perfect outing. Gringos, were you as miffed as we were by the ambivalence given to marking Pirlo? Nice write up. What an amazing chalkboard. That’s either a huge compliment to the US back four that they were able to thwart so many penetrating balls from the Italian master (no thanks to that slack in the midfield) OR it says a lot about Italy’s lack of offensive bite at the moment. You had the feeling that at any moment one of those runs by Giovinco was going to beat the trap. But it never did, or when it did get dangerous Howard played super keeper. Thought experiment–would an incutting Donovan at right mid have clogged up Pirlo’s options a bit? We’ll never know but it’s definitely a vulnerability we’ll have to sort out. I’m glad you pointed it out here. Donovan at right mid might have caused Pirlo problems, but it would have been interesting to see if that positive would outweigh the negative of Cherundolo being isolated more. Couldn’t agree more. If Italy had scored it would have been through a Pirlo created chance. 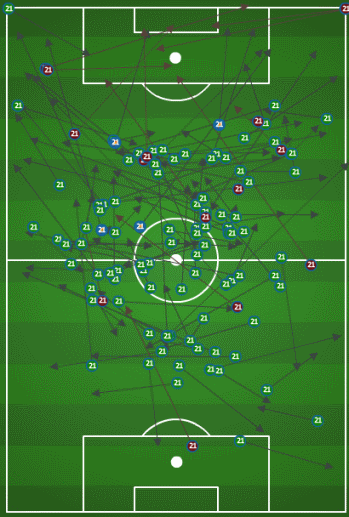 Looking at the touch tracker, I wonder if any of the outlet passes made from behind midfield, excluding counters (which werent the main thrust of the Italian attack), are even worth considering. Pirlo did most of his damage around the 18 yard box. Though, I cant say that I have a solid answer to your question as to *why* no one decided to hassle Pirlo other than having a lot of confidence in the back four. Great to see an intelligent write up! This is my first time to this site and it is refreshing. Many people in America want this attacking force of a team, but first we must mature tactically. So it is great to see the type of deduction that used with Bocanegra knowing the game plan of the Italians, but the team not nullifying it. I hope Klinsman is not just trying to make our soccer more attractive and make it more intelligent!